MH Themes has developed some of the most popular magazine themes for WordPress. Join thousands of happy customers from over 110 countries around the world and get access to our collection of WordPress themes including support and regular theme updates. WordPress is the best choice to run editorial or business websites and with our growing collection of high-quality premium WordPress themes you will have full flexibility for your website, no matter if you are running modern online magazines, dynamic news websites or blogs. MH Magazine is one of the most popular magazine WordPress themes which you can use to run editorial websites like modern online magazines, dynamic news websites or professional blogs. You can display lots of content well-organized on your front page and monetize your site by displaying advertisements on various locations. This flexible magazine theme for WordPress is suitable for various topics and content genres. You can launch all kinds of awesome and unique editorial websites by making use of the various integrated layout options and flexible custom widgets of MH Magazine. MH Edition is a flexible and visually sophisticated magazine WordPress theme for technology and news online magazines. 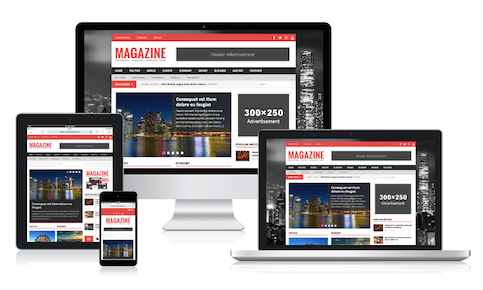 This magazine theme can transform your current website into a powerful yet lightweight online magazine or news website with a nice flat design and a fully responsive layout, suitable for all modern mobile devices. MH Squared WordPress Theme is a responsive magazine WordPress theme that comes with helpful options, awesome features and powerful widgets just waiting for your contents. This sleek magazine WordPress theme is perfect for anyone starting their own online magazine, dynamic news website or other online publication of any genre. MH Joystick WordPress Theme is an attractive, responsive games magazine WordPress theme that comes loaded with options and useful widgets for any content genre. This stunning theme for WordPress will transform your mundane blog into a bright and vibrant online magazine that’s suitable for all modern browsers and mobile devices. MH Cicero Blog WordPress Theme is perfect for blogging websites and comes with a flat styled design. Start a modern and creative WordPress blog for personal or business purposes and benefit from nice & useful integrated features. MH Cicero WordPress Theme is an ideal solution for minimalistic and appealing websites and blogs. MH Elegance WordPress Theme is an exclusive, unique and beautiful WordPress theme for all kinds of purposes. This WordPress theme is suitable for business websites, high-class blogs, unique portfolios or creative websites. Showcase and present your content in an elegant and sophisticated way and benefit from a sleek and clear-cut design. MH Impact is a flexible business WordPress theme in modern flat design. This fully responsive template is ideal for all kind of fresh and attractive business websites and fits perfectly for small and large companies or organizations. It is suitable for all sorts of business branches as manufacturing and trade firms, IT companies or the service sector.